How to opt-out of upgrade to Acrobat Reader DC? Upgrading to Acrobat Reader DC is free. See What's new in Acrobat Reader DC. 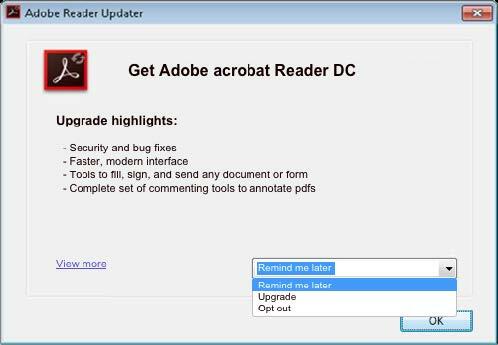 When you see a prompt to upgrade your Adobe Reader X or XI to Reader DC, you can follow the prompt to decide whether you want to upgrade to Reader DC or opt-out of the upgrade. When you open a document in Adobe Reader XI, an in-app prompt is displayed below the toolbar as shown in the screenshot below. Choose Opt-out from the Upgrade drop-down menu. Alternatively, if you see the following toast notification for upgrading your Reader XI to Reader DC, click anywhere in the notification pop-up. The Adobe Reader Updater dialog box is displayed. Upgrade: Upgrade your Reader to the latest Reader DC. Remind me later: Shows the notification after seven days. Opt-out: Don't upgrade and stop showing the notification to upgrade to Reader DC. You see one of the following toast notifications for upgrading your Reader X to Reader DC. Click anywhere in the notification pop-up. The Adobe Reader Updater dialog box is displayed.